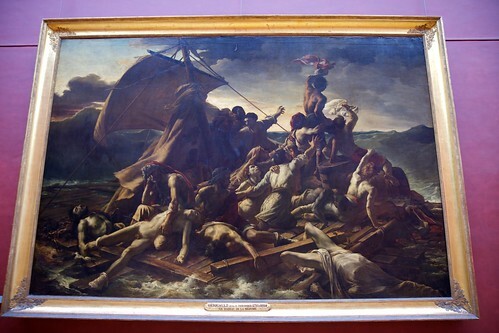 The Raft of the Medusa (French: Le Radeau de la Méduse) is an oil painting of 1818–1819 by the French Romantic painter and lithographer Théodore Géricault (1791–1824). Completed when the artist was 27, the work has become an icon of French Romanticism. 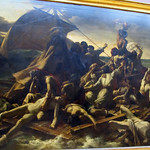 At 491 cm × 716 cm (16′ 1″ × 23′ 6″), it is an over-life-size painting that depicts a moment from the aftermath of the wreck of the French naval frigate Méduse, which ran aground off the coast of today's Mauritania on 2 July 1816. On 5 July 1816, at least 147 people were set adrift on a hurriedly constructed raft; all but 15 died in the 13 days before their rescue, and those who survived endured starvation and dehydration and practiced cannibalism. The event became an international scandal, in part because its cause was widely attributed to the incompetence of the French captain. Géricault chose to depict this event in order to launch his career with a large-scale uncommissioned work on a subject that had already generated great public interest. The event fascinated him, and before he began work on the final painting, he undertook extensive research and produced many preparatory sketches. He interviewed two of the survivors and constructed a detailed scale model of the raft. He visited hospitals and morgues where he could view, first-hand, the colour and texture of the flesh of the dying and dead. As he had anticipated, the painting proved highly controversial at its first appearance in the 1819 Paris Salon, attracting passionate praise and condemnation in equal measure. However, it established his international reputation, and today is widely seen as seminal in the early history of the Romantic movement in French painting. Although The Raft of the Medusa retains elements of the traditions of history painting, in both its choice of subject matter and its dramatic presentation, it represents a break from the calm and order of the prevailing Neoclassical school. 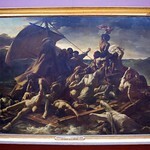 Géricault's work attracted wide attention from its first showing and was then exhibited in London. The Louvre acquired it soon after the artist's death at the age of 32. The painting's influence can be seen in the works of Eugène Delacroix, J. M. W. Turner, Gustave Courbet, and Édouard Manet.